This is a collection of biographies about master caricature artists featured on DonkeyHotey.com. The items listed below are linked to from the "Caricature Artists - In Memoriam" slideshow. This page also includes indexes of Links and Credits, Mini-Biographies, and Extended Posts about master caricaturists that will be added to the slideshow and the biographies over time. Links and credits from the "Caricature Artists - In Memoriam" slideshow images in order of appearance. Use these links to access the source image used in the slideshow and get more information about the individual caricature artist. Title Card - Isaac Robert Cruikshank: Caricature of George IV published in 1820. PD source: Library of Congress. More info: Wikipedia, Wikimedia Commons, Library of Congress, British Museum, National Portrait Gallery UK. William Hogarth: Caricature of John Wilkes published in 1763. PD source: Wikimedia Commons. More info: Opinionated Art. Thomas Rowlandson: "Comedy in the Country. Tragedy in London" published in 1807. PD source: Library of Congress. More info: Opinionated Art. James Gillray: Caricature of William Pitt published in 1805. PD source: Library of Congress. More info: Opinionated Art. George Cruikshank: "Snuffing out Boney!" published in 1814. PD source: Wikimedia Commons. More info: Opinionated Art. J. J. Grandville: "The Fools Invent Fashions, and the Sages Follow" published in 1845. PD source: Wikimedia Commons. More info: Opinionated Art . Honoré Daumier: Caricature of La Grange published 1853. PD source: Wikimedia Commons. More info: Opinionated Art. John Leech: Caricature of Henry The Eighth published in 1894. Source: Comic History of England by Gilbert Abbott à Beckett - page 345. More info: Opinionated Art. John Tenniel: Illustration of Humpty Dumpty published in 1872. Source: Wikimedia Commons. More info: Opinionated Art. Frank Bellew: Caricature of Abraham Lincoln published in 1854. PD source: Wikimedia Commons, Harpweek. More info: Wikipedia, Wikimedia Commons, Library of Congress, NYPL Digital Collection. Joseph Keppler: Caricature of William H. Vanderbilt published in 1879 in Puck. PD source: Wikimedia Commons. More info: Wikipedia, Wikimedia Commons, Library of Congress, GreatCaricatures.com. Carlo Pellegrini: Caricature of Oscar Wilde published in 1879 in Vanity Fair. PD source: Wikimedia Commons. More info: Wikipedia, Wikimedia Commons, British Museum, National Portrait Gallery UK. Thomas Nast: "The caricature that captured Boss Tweed" titled "Tweed-le-dee and Tilden-dum" in 1879 in Harper's Weekly. PD source: Wikimedia Commons. More info: Opinionated Art. André Gill: Caricature of Charles Darwin published in La Petite Lune in 1878. PD source: Wikimedia. More info: Wikipedia, Wikimedia Commons, British Museum, GreatCaricatures.com. José Guadalupe Posada: A caricature of Francisco Madero titled "Calaveras del montón, número 2" published circa 1910. PD source: Library of Congress. More info: Wikipedia, Wikimedia Commons, Library of Congress, British Museum. Bernhard Gillam: A caricature of James G. Blaine titled "'The Soul of Blaine' Still on the Rampage" published in Puck in 1885. PD source: Library of Congress. More info: Wikipedia, Wikimedia Commons, Library of Congress. 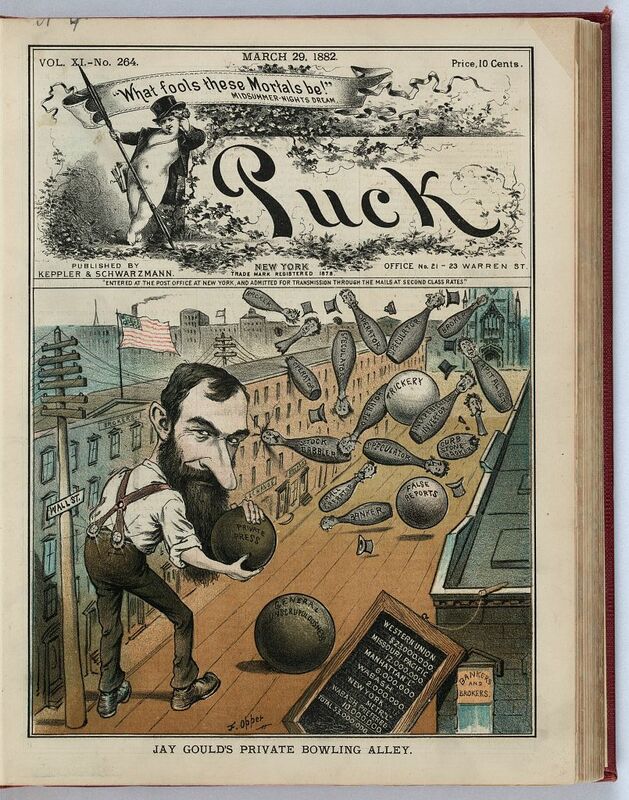 Frederick Burr Opper: A caricature titled "Jay Gould's Private Bowling Alley" published in Puck in 1882. PD source: Library of Congress. More info: Wikipedia, Wikimedia Commons, NYPL Digital Gallery, Library of Congress. Max Beerbohm: "Max" by Walter Sickert. Published December 9, 1897 in Vanity Fair. PD source: Wikimedia.. More info: Wikipedia, Wikimedia Commons, National Portrait Gallery UK, Caricatures of Twenty-five Gentlemen.